Wheal Jane Consultancy mining geologist and longstanding target shooting enthusiast Dale Foster has returned to Cornwall with a clutch of winner’s medals from a national target shooting event. During the major event know as the Phoenix Meeting held at Bisley, Dale participated in fifteen disciplines in the Gallery Rifle Small Bore, Gallery Rifle Centrefire, LBR/LBP and Muzzle Loading categories. As a result of his dedication to the sport, Dale came away from the event with two gold medals; one bronze and a grand master medal for achieving standards scores in a number of the disciplines he entered. 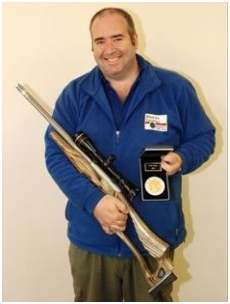 This is not the first time that Dale has enjoyed success in a major shooting competition; in 2009 he took part in the Field Target Air Rifle World Championship which was held in South Africa and came home with a 3rd place in the spring air gun category. Dale has no plans to rest on his recent achievements. He is already practicing for the National Championships to be held at Bisley in late August and then an international invitation gallery rifle competition taking place in South Africa in early October. Everyone at the Wheal Jane Group congratulates Dale on his amazing medal haul and wishes him every success in his upcoming events. Dale had been an employee of the Company since 1999 and holds the position of Senior Mining Geologist in the Company’s mining and environmental consultancy business. Dale specialises in carrying out mining searches, mundic testing and environmental surveys, all of which complement his other great passion, Cornish mining.